Habit: Shrub, small tree, coarsely branched, non- and/or glandular-hairy. Stem: erect. Leaf: alternate, evergreen, serrate. Inflorescence: raceme, in fall, bracted; pedicel jointed to flower, bractlets 2, +- basal. Flower: sepals 5, fused at base; petals 5, fused, [cylindric to] urn-shaped; stamens 10, anthers dehiscing by pores, awns 4, [elongate to] vestigial, filaments +- straight, with hairs, papillae [or only papillae]; ovary superior, chambers 5, placentas axile, stigma truncate [or head-like/peltate]. 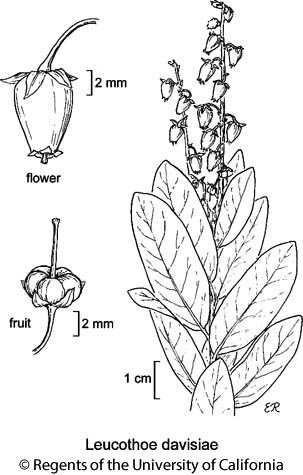 Fruit: capsule, loculicidal, erect, persistent after seed dispersal, dehiscing tip to base. Seed: many per chamber, small, generally winged. Stem: < 1.5 m. Leaf: 1.5--8 cm, oblong to elliptic or ovate, leathery. Inflorescence: in upper leaf axils, < 15 cm, many-flowered; pedicel recurved. Flower: corolla 5.5--8.5 mm, >> calyx, white. Fruit: < 6 mm wide, thin-walled. Citation for this treatment: Walter S. Judd 2012, Leucothoe davisiae, in Jepson Flora Project (eds.) Jepson eFlora, http://ucjeps.berkeley.edu/eflora/eflora_display.php?tid=30815, accessed on April 20, 2019. KR, CaRH, SNH, Wrn; Markers link to CCH specimen records. Yellow markers indicate records that may provide evidence for eFlora range revision or may have georeferencing or identification issues. Purple markers indicate specimens collected from a garden, greenhouse, or other non-wild location.